Today (6/4) ONLY - get this Razor Berry Kick Scooter for just $19! Your kids will love riding around the neighborhood on this brightly-colored Razor Berry Scooter. 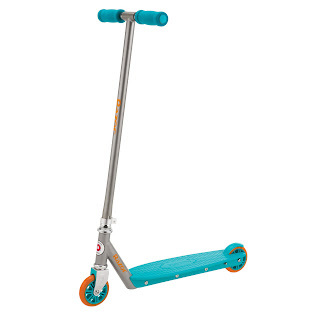 The trendy scooter features a rear fender brake for safe stopping and urethane wheels for a smooth ride. The skate scooter can hold kids up to 143 lbs, and it features a plastic deck reminiscent of a skateboard. It has a rigid tube that won't fold up but the handlebars will. The steel frame is built to be durable.